Blended with sustainable Soy Wax for a long, slow and clean burn, these lovely candles are also made with an organic wooden wick which creates the soothing sound of a crackling log fire. This magical crackle and their outstanding fragrance blends, which have been masterfully created by expert perfumers, really set these candles apart from the norm. 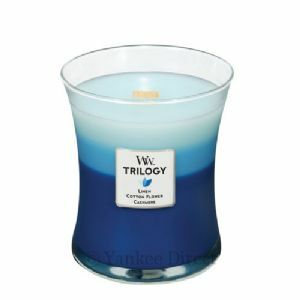 Made in America, under strict laboratory conditions, you can be assured that both the fragrance and burn quality are paramount to this high profile Woodwick Candle Brand. The same amazing fragrance blends have also been applied to reed diffusers and car vents, ensuring that you can experience your favourite Woodwick fragrances on the move or, without the flame. Reed diffusers come into their own during the summer months when windows and doors are open and their fragrance gently breezes around your home.